Pig producers could reduce antibiotic usage and improve animal health and productivity by adopting a new approach piloted by the poultry industry. Following tremendous success helping poultry producers to reduce antibiotic usage, St David’s veterinary team is now branching into the pig sector. The initiative, which will be launched at the British Pig & Poultry Fair, is based on improving the animals’ natural health through a combination of probiotics, organic acids and water sanitation. Amazingly, animals’ bodies comprise 90% bacteria – in effect people are only made up of 10% human cells. Through its Applied Bacterial Control (ABC) programme, St David’s looks closely at all husbandry factors that influence this microbiome, and develops a bespoke strategy to boost natural gut health and reduce the need for routine antibiotic treatments. Central to the ABC system is clean water and the Seed, Weed and Feed approach, developed by Professor Stephen Collett from the University of Georgia, USA. This involves seeding the gut with beneficial flora, feeding them by creating the right gut environment, and weeding out unfavourable microbes. For more information visit www.stdavids-poultryteam.co.uk. 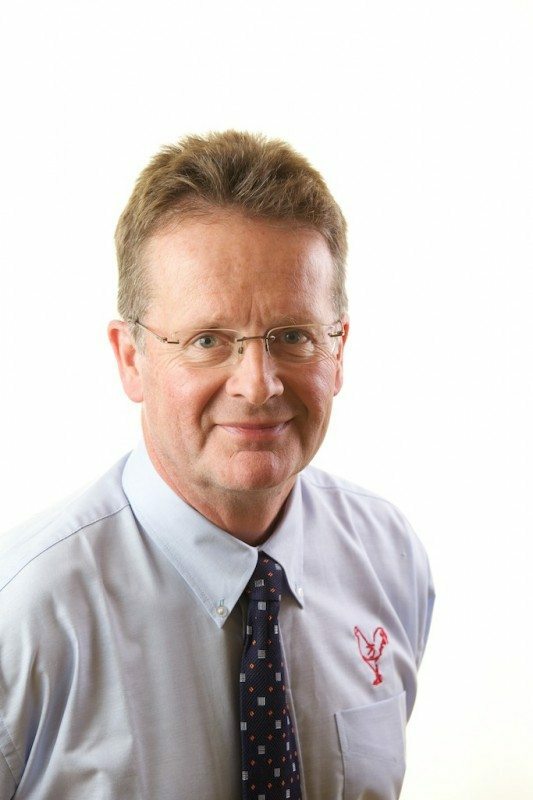 St David’s Poultry Team Ltd is one of the UK’s largest poultry practices, run by a team of dedicated poultry vets and staff to offer the highest standard of poultry care throughout the industry. Our Head Office near Exeter in Devon covers England and Wales, with further branches in Scotland, Ireland and Northern Ireland. We supply services to commercial egg laying companies, the broiler industry, broiler breeder companies, hatcheries and game bird enterprises. The aim of our business is to provide a complete veterinary service with a “hands on” approach to meet all the requirements of today’s modern farming practices. Our specialised team of veterinary surgeons are led by Directors Richard Turner, Alan Beynon and Richard Jackson in Exeter alongside Ben Crisp, with Margaret Hardy, Greg Koulianos and Carlos Bilello in Northern Ireland; Conor Sheehy and Rebecca McAllister in Limerick; Barry Thorp and Jan Dixon in Scotland; Suzy Ackerley in Shropshire; Kenny Nutting in Salisbury; Helen Errington in Cumbria and Catriona Gaudie in Northallerton, Yorkshire. The veterinary team are supported by our Field Service staff, Office team and Dispensary staff. We are happy to help with any enquiries from the media. For more information please contact Olivia Cooper on 01392 840009 or email [email protected].